Heat all ingredients until hot. Serve in small individual bowls. 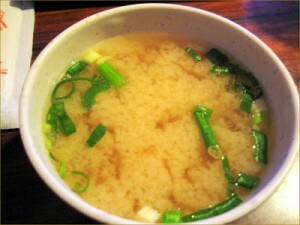 Heat soup stock, add miso pastes, mix until smooth. Cut fried bean cure into strips (1/4″) and add to soup with the cubed tofu and oysters, and simmer until oysters are just plump, less than one minute. Remove from heat; add parsley and pour soup into 4 bowls. Garnish with grated ginger and sansho. Wipe kelp with damp cloth and cut a 1/2″ fringe along one side. Put kelp in cold water, heat moderately until just under a boil. Pull out kelp and reserve. Bring water to boil, add bonito. Remove from heat and let stand for 2-3 minutes. Strain through a sieve until clear; reserve damp fish flakes. Take kelp and bonito leftover from first stock making and combine with 1 1/4 pints water and simmer over moderate heat for 4 minutes. Strain and discard solids. 1. Heat the cooking oil over med heat in a non-stick frying pan. 2. Fry the ginger and green onion until the green onions start to brown. 3. Add the fish and pan fry until the fish is cooked. Cooking time will depend on thickness of fish filets. Turn filets once during cooking. 4. Add the soy sauce and sugar to pan and cook until the sauce bubbles. Filets should be coated with sauce and sauce should start to form a”crunchy” coating from caramelizing sugar. Place the salmon steaks in a shallow baking dish. Combine all the remaining ingredients and pour over the steaks. Marinate the steaks in the refrigerator for at least 4 hours, turning occasionally. Place the fish on a well greased grill or broiler 4″ from moderately hot coals or other heat source. Cook 10 minutes per” of thickness (half the time on each side) or until the fish flakes easily with a fork. Baste with the sauce when turning.